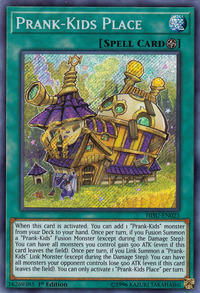 When this card is activated: You can add 1 “Prank-Kids” monster from your Deck to your hand. Once per turn, if you Fusion Summon a “Prank-Kids” Fusion Monster (except during the Damage Step): You can have all monsters you currently control gain 500 ATK (even if this card leaves the field). Once per turn, if you Link Summon a “Prank-Kids” Link Monster (except during the Damage Step): You can have all monsters your opponent currently controls lose 500 ATK (even if this card leaves the field). You can only activate 1 “Prank-Kids Place” per turn.